Rev. Eric Estes was born in Long Branch, NJ on December 14th, 1978 and was raised in Central Florida. He was baptized into Christ exactly one month after his birthday on January 14th, 1979. He grew up and was confirmed at Resurrection Lutheran Church of Orlando. After attending Florida International University and earning a Bachelor’s of Science in Management Information Systems Pastor Estes served as an Application Support Specialist at the Peabody Hotel Orlando for three years. 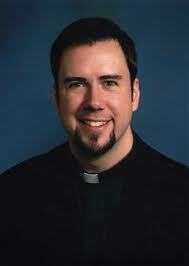 He then enrolled at Concordia Seminary St. Louis in 2004. He spent his vicarage year at Shepherd of the Coast in Palm Coast, FL and graduated with a Master’s of Divinity in 2008. Pastor Estes was ordained at his home congregation Prince of Peace in Orlando, FL on June 15th, 2008. He was installed as pastor of Lutheran Church of the Redeemer in Columbus, GA the following Sunday on June 22nd, 2008. Pastor Estes is currently a member of the LCMS FL-GA District Pastoral Conference Committee and the current President of Muscogee Rotary Club in Columbus, GA.
Pastor Estes is married to his childhood friend Jennifer. Jennifer was raised in Hickory, NC until she was 9. Her family then moved back to their hometown of Orlando, FL. Jennifer attended and was confirmed at Trinity Lutheran Church in downtown Orlando. Pastor and Jennifer are blessed with three children: Benjamin (11), Joshua (10), and Elizabeth (6). Jennifer received a Bachelor’s at Troy University, AL and a Master’s at the University of Central Florida in the fields of Sports Medicine and Exercise Physiology respectively. She served as a Certified Athletic Trainer for a decade and is now a busy mother and homemaker. She plans to enter a new professional field in the future. Her interests include reading, crafting, scrapbooking, and learning about God’s creation.